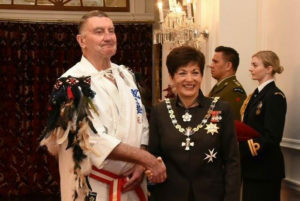 A Nelson karate master who has used the martial art as a force for good in the community for more than 40 years has been honoured for his work.Founder of Nelson Seido Karate Andy Barber has received the Queen’s Service Medal for services to karate and the community. Originally from Wellington, Barber took his passion for karate to the extreme early on. He travelled to Japan at 19-years-old to train under Master Oyama, the founder of Kyokushin, a style of full contact karate. Barber has achieved great successes since opening his own club in Nelson in 1974 and has made an impact in the community working with under privileged groups. He said there had been many success stories from people who had benefited from joining karate. Seido, meaning “sincere way” in Japanese, is a running theme through Barber’s life. His karate programmes cater to all ages, budgets and abilities, including blind and deaf students. Barber first took a shine to karate when he was 16, being inspired in the early 1960s by martial arts TV shows like The Avengers. He said he also wanted to be able to look out for his siblings. In 1989 Barber opened Uchi Deshci House for young unemployed people to live in a safe environment away from drugs and alcohol for six months while learning karate and basic life skills. That same year he started the Seido Benefit Fund and since then has raised more than $100,000 for Nelson families in need. Barber said he was “honoured and excited” to be receiving such recognition through the Queen’s Service Medal.